Muscle wasting in old age is caused by a loss of nerves, new research shows, opening the prospect of reversing the condition in the future. While this process inevitably affects everyone living long enough, until now the process has not been understood. The research from Manchester Metropolitan University, published in The Journal of Physiology, suggests that muscle wasting follows on from changes in the nervous system. By the age of 75, individuals typically have around 30% to 50% less nerves controlling their legs. This leaves parts of their muscles disconnected from the nervous system, making them functionally useless and so they waste away. However, healthy muscles have a form of protection, in that surviving nerves can send out new branches to rescue some – but not all – of the detached muscle fibres. This protective mechanism is most successful in older adults with large, healthy muscles. Professor Jamie McPhee, from Manchester Metropolitan and senior study author, said: “Our challenge now is to find ways to increase the success of nerve branching to rescue detached muscle fibres and thereby reduce the numbers of older people in our neighbourhoods with low muscle mass and muscle weakness. "Right now in Europe there are at least 10 million older people with low muscle mass, which is a medical condition known as sarcopenia. They are at higher risk of social isolation, falling, bone fracture, disability and hospital admission. 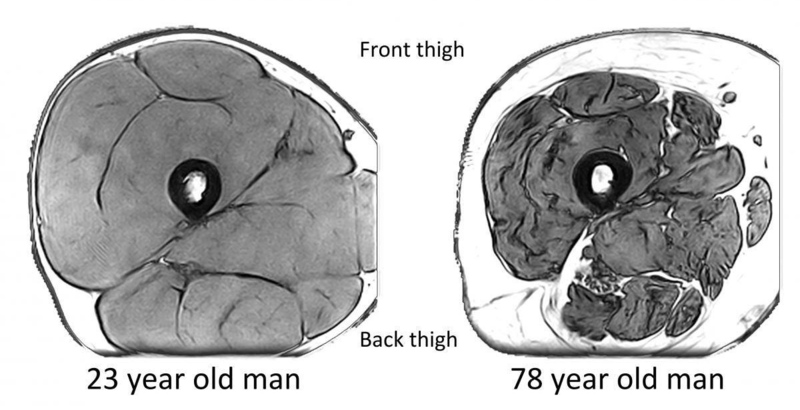 When the internal protective mechanism is not successful and nerves are unable to send out new branches, it can result in extensive muscle loss – sarcopenia, which affects an estimated 10% to 20% of people aged over 65 years. The researchers do not yet understand why the connections between muscles and nerves remain healthy in some people and not in others. The race is now on to use this new knowledge to delay old-age weakness by either slowing the decline or by increasing the success of nerve branching to rescue detached muscle fibres. The research carried out in conjunction with University of Waterloo, Ontario, and The University of Manchester, involved using MRI to gain a detailed look at the muscle tissue, followed by enhanced electromyography to record the electrical activity passing through the muscle to estimate the numbers and the size of surviving nerves available to rescue muscle fibres. The researchers are currently looking at whether regular exercise in middle- and older-age slows the process of muscles becoming disconnected from the nervous system, or improves the success of nerve branching to rescue detached muscle fibres. The goal is to identify the best type of exercise – strength training or endurance – and to understand the physiology of why the nerve-muscle changes occur as we get older.